Given that the preceding cartoon was an upper — here's one to balance the "upping" out a bit. It includes a wide range of gripes prevalent in all small towns. My thinking being: Every reader will find something in it they can identify with as a personal complaint. And you know how I like to keep things personal, eh? HA! 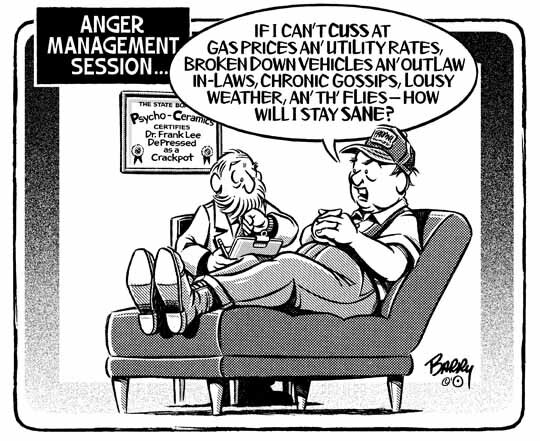 For sure, I doubt any of your readers will go so far as to carry their personal pick of the toon's gripes to a psychotherapist, as the guy in the toon has done — still, I couldn't resist the "Anger Management" scenario. BTW: I always place my NEW uploads at the top of their respective online pages. NEXT: I'm just getting started on something for MOTHER'S DAY — one of my very favorite holidays! Expect to send it your way on Thursday. Hope the weather is pleasant there, with sunny skies & gentle, refreshing breezes. Unfortunately, that's not the forecast for here today. HA!